A letter currently on display at the Israel Museum resounds a familiar theme. It is a request for the donation of Arba Minim (the traditional four species used during the Succoth holiday) for use by soldiers in the army during Succot. There is only one thing unusual about this call for help. No, it is not the Israel Defense Forces (IDF) that sent out the message. The donated supplies were for Bar Cochba's troops during the Jewish Revolt (132-135 CE). 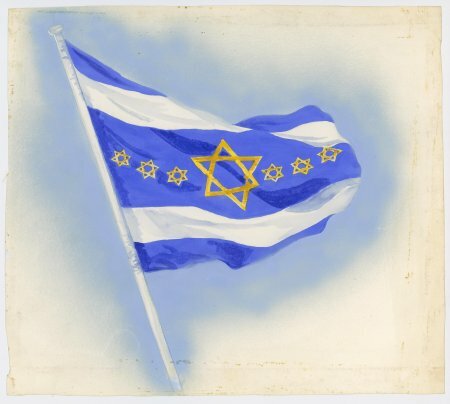 This is only one of 150 documents, new and old, on display in the "Blue and White Pages" exhibit at the museum in a joint effort with the Israel State Archives. The exhibit highlights events in the history of the Jewish people from ancient times through the current period. The exhibition started with a request that documents be shown in the Knesset halls. That was considered too limited, and after rounds of discussion it was decided that the Israel Museum would be the most appropriate venue. Not everything on display is a document in the modern sense of the word. An inscription on a clay shard tells of the recent torching of Azeqah by the Babylonians. Dating is relatively easy. As we know, also nearby Lachish fell, then Jerusalem was captured by the Babylonians (Jeremiah 34:7), and the First Temple was destroyed. The oldest reliable Bible in existence is the Aleppo Codex, dated to approximately 920 CE. 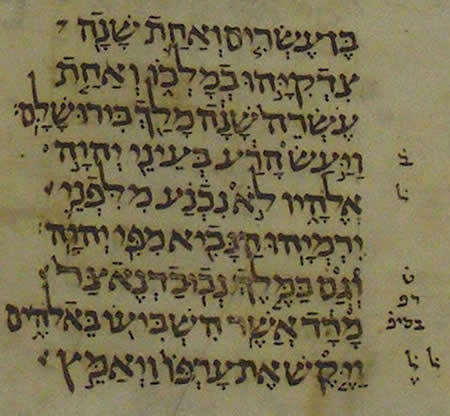 It is reported to have been verified by Aharon ben Asher, one of the famous Tiberius grammarians For many years the Codex was kept in a synagogue in the Syrian city of Aleppo, hence its secular name. Following the UN partition decision on 29 November 1947 the synagogue was sacked, and the codex disappeared. In 1958 about two-thirds of the codex was found and given to Yitzchak Ben-Zvi, then serving as the second President of the State of Israel. On display is a page from the Book of Chronicles. The exhibit is arranged topically rather than according to date, even though historical periods are often a psychologically more convenient way to bring order to numerous details. Wandering through the exhibits is, in any event, a fascinating experience. Virtually everything is an original. 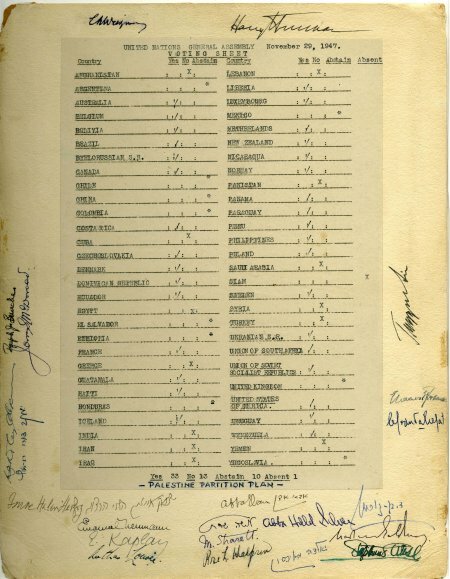 A unique exception is a copy of the aforementioned 29 November 1947 UN decision approving the partition of Palestine. What is authentic about that document are the autographs of many of the key people involved, including U.S. President Harry Truman. The establishment of the State of Israel is obviously stressed, since the exhibit is in the spirit of 60 years of the State. The last Mandate flag to be lowered by departing British forces and an early hand-sewn Israeli flag are draped over an introductory sign at the entrance to the exhibit hall. Independence was declared in a Tel Aviv ceremony kept secret until virtually the last moment, but the preparations were extensive. On display are drafts and corrections to the Declaration of Independence. Not everything can be put into the showcases. There is not enough room. One item kept in the State Archives but not shown is an invitation to the ceremony. 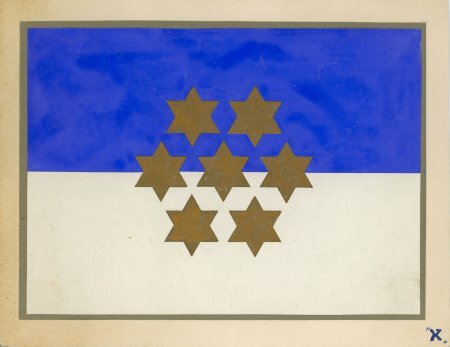 Upon the establishment of the State there were calls for the public to suggest a national flag, and several of the samples submitted are on display. So is a memo dated 5 November 1948 citing the urgency of deciding upon a national symbol. Beyond any doubt, David Ben-Gurion was a major influence on the history of the State of Israel. To this day he remains a controversial figure in many circles. One of the uncontested positive steps that he took is shown in a letter that he wrote on 4 October 1949, advocating that places in the Negev be named based upon Hebrew sources and not translations from the Arabic. The first years of the State were difficult from many perspectives. Even Yitzchak Ben-Zvi, a year before he took office as the President of Israel, was issued a meat ration book in 1951. In that same year Chaim Sheba, Director-General of the Ministry of Health, warned that the plan suggested for draining Lake Hula might hamper efforts to wipe out malaria. The Six Day War was a major event in Israeli history. Shown in "Blue and White Pages" is the record from the 6 June 1967 cabinet meeting authorizing IDF forces to enter Arab Jerusalem. Much closer to today are pages from the diary of Ilan Ramon, the Israeli astronaut killed aboard the spacecraft, Columbia. In deference to the family and their request for privacy, the material is shown from a distance and is not really legible. 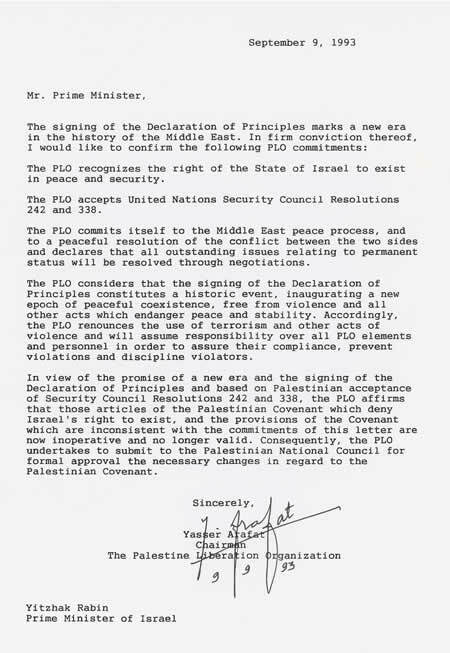 Visitors to the exhibit can also see the 1993 letter sent to Yitzchak Rabin by Yasir Arafat specifically stating, "The PLO recognizes the right of the State of Israel to exist in peace and tranquility." This is displayed near original signed copies of the peace treaties with Egypt and Jordan. 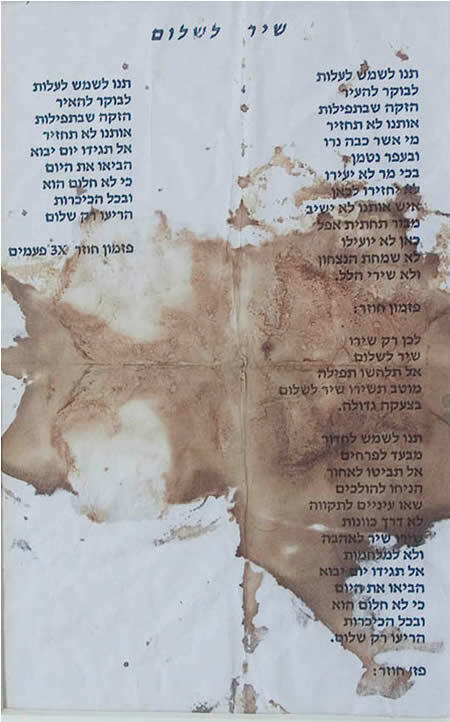 On a sad note, the public can view the blood-stained copy of the Song of Peace, folded in Yitzchak Rabin's pocket when he was assassinated. Note: The Israel Museum is currently under renovation. "Blue and White Pages" is in the Youth Wing. The main building is closed to the public until construction is scheduled to be completed in 2010.